The weekend always goes so bloody quick, so Sundays are best spent relaxing and pampering yourself. I don't really have a skin regime because I used to have really bad skin. I tried every product known to man to try and clear it but it was only when I went on strong medication it cleared. The dermatologist actually suggested that all the different creams and scrubs can make it worse so since then I only ever wash my face with water and nothing else. Though lately I've looked at my skin and it does look really dull so I thought I should try some products that would be kind to my skin but actually work so tonight I decided to try the Simple range. Both products say for dry skin use only once a week. The thing about Simple products is just that, they are simply Simple, no frills, no fuss just skin care. 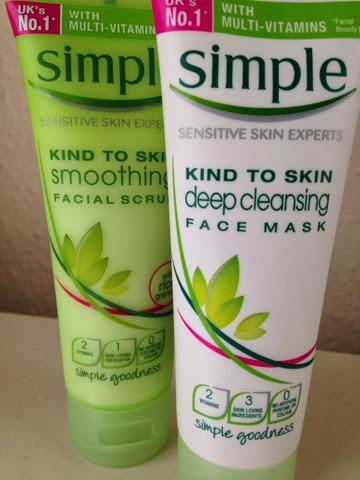 I used the Smoothing Facial Scrub first and then the Deep Cleansing face mask. Both products were great, definitely left my skin feeling a little more loved, smooth and soft. The face mask wasn't too thick and it didn't go hard and flakey. It actually felt like it was just sinking into my skin, though the bottle says to only leave it on for around 3mins. I'd definitely recommend it to anyone who has sensitive skin.